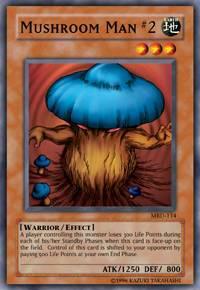 MUSHROOM MAN #2 - Yu-Gi-Oh! A player controlling this monster loses 300 Life Points during each of his/her Standby Phases when this card is face-up on the field. Control of this card is shifted to your opponent by paying 500 Life Points at your own End Phase.